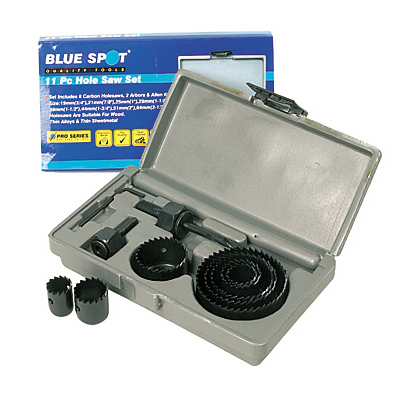 Pro series 16pc hole saw set from Blue Spot Tools. This hole saw set is suitable for use on wood, thin alloys and thin sheet metal. The hole saw set includes: 12 carbon hole saws (19, 21, 25, 32, 38, 44, 51, 64, 76, 89, 102, 127mm), 2 arbors and adjusting allen key. Precision made, heat treated and fully hardened steel. 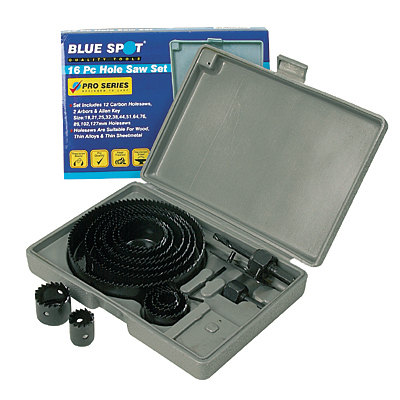 A comprehensive hole saw set from Blue Spot Tools.